Private 5 acre mountain top newly built spacious Chalet overlooking Holimont Ski Resort and surrounding mountains. 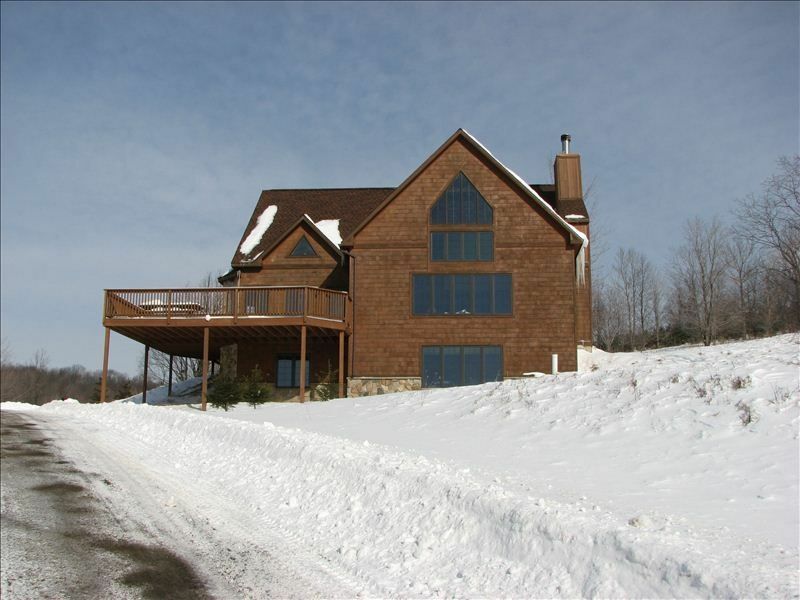 Thé 5 Acre property abuts over 200 acres of wooded property with hiking trails and over looks Holimont Ski Resort. The house is ideal for two family rentals with privacy as there are two bedrooms and full bath on second level and two additional bedrooms and full bath on the lower walkout level. We rented this spectacular home for the weekend of our son's wedding in Ellicottville. Our stay couldn't have been more perfect. This spacious home was immaculate, well appointed, comfortable, private, and conveniently located just a short drive from Holimont, the shops and restaurants in town, and Holiday Valley. The views of the mountains during the day and the Milky Way at night were amazing. Wish we could have stayed longer! Everything about this chalet screams comfort. It contains everything you need, and the extra comforts that didn't know you did. We had a great time, and I would definitely come back in the future. My family and I spent Thanksgiving in this fabulous home. It was a perfect setting for a wonderful holiday. The range and oven are perfect for multiple cooks cooking a holiday meal, 5 burner range, oven with small side oven for keeping food warm, center island with prep sink. The sleeping arrangements were perfect. Although there is a TV room downstairs we spent all our time in the gorgeous great room with a fabulous view, wood burning fireplace and deck off the dining room with a large picnic table. You will need a car because it's off the beaten track but it's actually perfect that way. It was so quiet at night that we all slept more soundly than we had in ages. It's perfect for two families!